iFixit is a famous company that tears down the latest gadgets to show you the inner parts and the way you can fix any of problem inside your gadget. 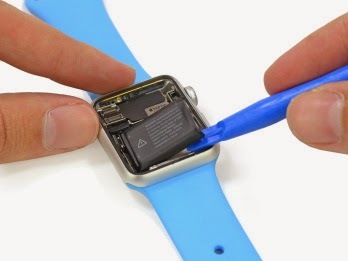 As the Apple Watch slowly starts arriving to customers, the engineers at iFixit have gotten their hands on the device and have started the teardown process. As usual, the site has shared detailed images of the teardown process and anecdotes along the way. The images give us the first look inside Apple Watch Sport, including a look at the Taptic Engine and Digital Crown. iFixit also notes that the antenna features Apple’s classic gold treatment as also seen on the 2015 Retina MacBook, giving even the entry-level Apple Watch Sport a hint of luxury. Furthermore, the teardown images show the internals of the Apple Watch compared to the internals of a classic mechanical watch. The teardown experts point out that while the required tools to repair an Apple Watch are different from those required for a mechanical watch, the process will not be easy and will most likely require an expert. The battery of the Apple Watch is right on top once the display is removed. The battery is also only slightly adhered to the inside of the device, which means it comes out relatively easily. 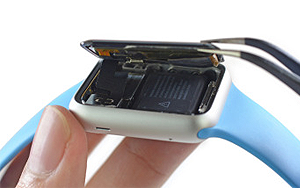 iFixit’s teardown of Apple Watch will show you more , so you can visit their site for high-resolution images and more notes about the internal parts of the newly launched fantastic gadget that is known as Apple Watch.